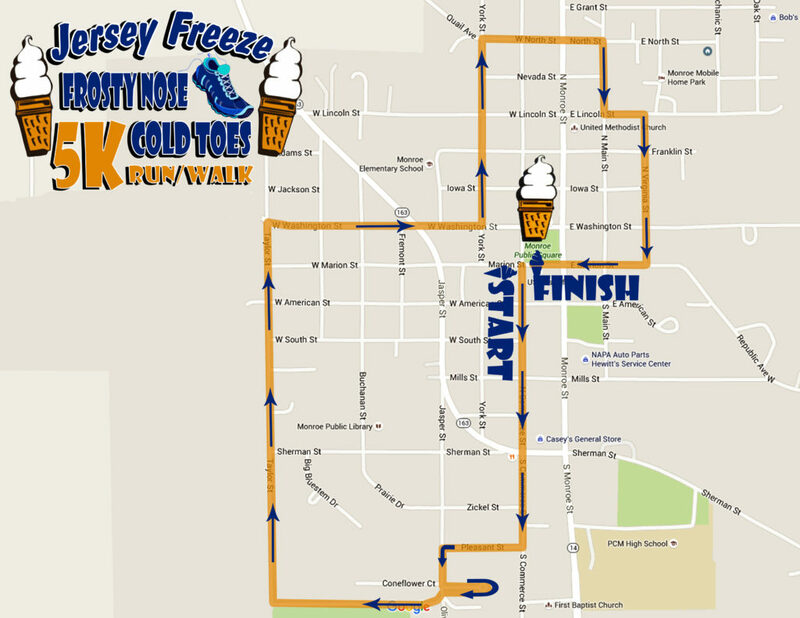 Jersey Freeze and the Monroe Old Settlers Committee have partnered again this year to bring you the 4th annual Jersey Freeze 5K Fun Run/Walk. The Frosty Nose/Cold Toes run will coincide with the spring opening weekend of Jersey Freeze. Proceeds will go to the Monroe Old Settlers fund. * Finish line results: Results will be displayed live at the finish line on a 48 inch TV monitor by age groups and gender. * Live results: Results will be available online as you finish the race on race day and the race link will be made available prior to the race so friends and family can check on your progress/accomplishment. * Finish certificate: Individualized finisher certificates will be available online for download or print immediately as you finish the race. * Facebook posts: You will also have the opportunity to post your accomplishment straight to Facebook from our results site by clicking the Facebook icon on your results link. * Finish line video: We will have a 20-30 second finish line video for each finisher available on the results website 3-4 days (or sooner) after the event unless mother nature surprises us with heavy rain or winds on race day. The race will start Saturday March 30th at 10:00am. The race will start and end at the City Square in Monroe, Iowa. Race registration cost is $25 for adults and $15 for kids 12 & younger. Registration includes a race t-shirt and ice cream at the finish line! Click here for a printable copy of the race results. They can also be accessed on True Time Racing Services website. Any questions can be submitted via the form below. We will get back to you as soon as possible!